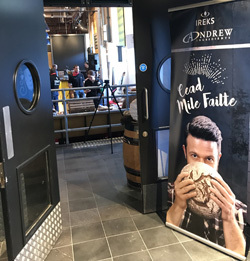 IREKS U.K. Ltd. and wholesaler Andrew Ingredients welcomed a group of more than sixty Irish and Northern Irish bakers to the Guinness Open Gate Brewery in Dublin for a “Craft Malt” themed evening on Wednesday 27th March. The evening began with a tour of Ireland's most popular tourist attraction, the Guinness Storehouse, where everyone was treated to seven floors filled with interactive experiences that combine Guinness' long brewing history with Ireland's rich heritage. The tour finished with a pint of the “Black Stuff” at the world-famous rooftop Gravity Bar, with a spectacular 360 degree view of the city. We then made our way across to The Open Gate Brewery, Guinness' experimental brewery, where the renowned Hop House 13 was born. The theme of the evening was Rockabilly, with the music provided by the very talented Donna Dunne & the Mystery Men. Then a range of innovative products and applications was showcased using our newly launched CRAFT-MALT – an aromatic malt cuvée for individual malt baked goods. It is so versatile that it can be used to create countless products including bread, rolls, croissants, crumbles for desserts, sauces and dressings...much of which we got to taste during the evening as part of our meal. As is frequently the case at our events, there were some shenanigans involved throughout the night, including three team games; a quiz, a strength competition involving a stein of beer and the messiest “There is Hops and Malt Lost”. Well done to the overall winners – Team Red! Thank you to all who attended. It was great to have an opportunity to catch up, showcase a new product and application ideas and, of course, to just relax and have some fun! 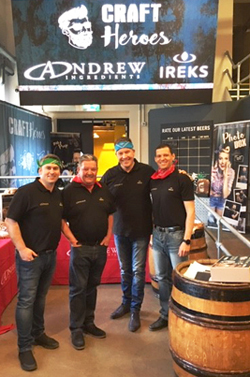 We hope you enjoyed your gift box – may you think of IREKS and Andrew Ingredients every time you fill the glass!